Stone lime kiln along River Road near Carpentersville. In Phillipsburg's Union Square, the "free bridge" that connects with Easton, PA, has withstood the high waters of the Delaware River's angry floods. South Main Street heads away from the square through the historic district, lined by a predominance of buildings whose original architecture has been stabilized or restored. While renovating Delahanty's Restaurant, the owners found canal boat poles probably used on the Morris Canal, which began here in Phillipsburg. The Vandegrift Bridge carries South Main over tracks of the Norfolk Southern before Shappell Park appears, where three Civil War-vintage seacoast mortars have rested for over a hundred years. Beside the onion-domed Byzantine Catholic Church, an ancient mile marker, shaped from native rock, has advised generations of sojourners, "44 miles to New Brunswick." A block beyond, the former Morris House, now Steve's Café, overflows with period photos and artifacts that afford glimpses of the town's essential role in the development of regional transportation and commerce. Another half-mile, and South Main Street passes under an awesome stone-arched railroad bridge. After a sharp right turn at the traffic light, Carpentersville Road proceeds a mile before crossing over I-78 into peaceful, idyllic farmland. 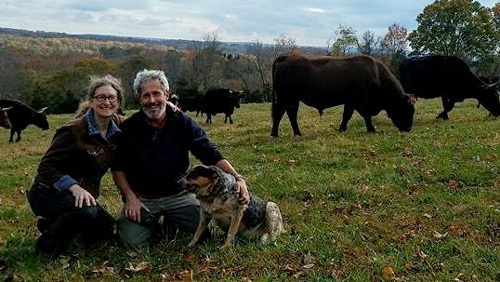 This is the Alpha/Pohatcong Grasslands, more than two thousand acres of farm fields, pastures, and grassland, half of which are preserved open space. On Oberly Road, beside a farm lane about a mile from Carpentersville Road, a small bench and plaque help mark a 128-acre tract that has been leased back to farmers, but is also known for excellent year-round birding. Carpentersville Road soon passes a Pennsylvania Dutch bank barn, built into a hill so that hay and grains stored on the second storey were easily accessed for feeding livestock housed in the lower level. At the railroad grade crossing, the first of six between here and Milford, Carpentersville Road becomes River Road. These tracks were laid in 1854 for the Belvidere-Delaware Division of the Pennsylvania Railroad--the "Bel-Del"--which stopped running decades ago. Today the "old" New York Susquehanna & Western #142 chugs along the tracks from the Phillipsburg station, escorting train-cars full of passengers along a few beautiful riverside miles where no other roads go. Special trainsÑa Wine Train, Mine Train, Corn Maze Train, Pumpkin Train, and Polar ExpressÑrun at various times during the year, although a Delaware River Railroad Excursion is delightful anytime. Engine #142, a coal-fired steam locomotive, is not really all that old. Built in China in 1989, based on an early 1900s American design, it is among the last steam locomotives built anywhere in the world and the only one still in use in New Jersey. The mine train stops for prospectors. Photo by Bob Koppenhaver. Paralleling the tracks, River Road weaves through riverside lowland. During Hurricane Diane's 1955 flooding, the lowest portions were under eight feet of water. And since more recent flooding, some homes along here have been raised a whole storey. In the small hamlet of Carpentersville to the south, old maps show a Bel-Del railroad station, store, post office, and gristmill. Some of these structures remain among a cluster of vintage homes. Below Carpentersville the river road becomes more dramatic, squeezed tightly between cliffs rising on the left and the train track on the right. Pay attention! 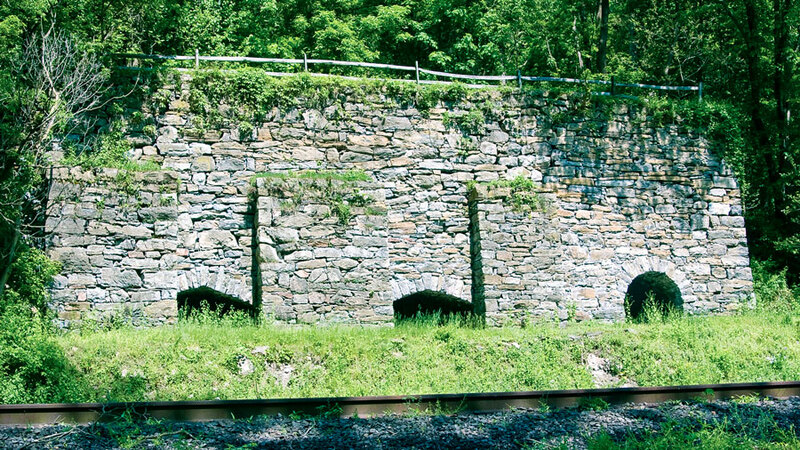 Just beyond the third grade crossing, two imposing, expertly-crafted stone structures are surviving examples of nearly two dozen commercial kilns that produced many thousands of bushels of lime from locally quarried limestone. Coal arrived by way of the adjacent railroad tracks to fuel the lime kilns and reduce the stone to its final product, which was shipped out on the same tracks, usually toward Flemington, Trenton, and Monmouth County. Lime was used in mortar, cement, and as a vital soil conditioner for farmers' fields. After turning under a low railroad overpass at the intersection with Creek Road, bear right over the small iron bridge spanning the Pohatcong Creek, staying on River Road. Around the end of Pohatcong Mountain, the Pohatcong Wildlife Management Area lies for a short distance on either side of the intersection with Pincher's Point road. Another Bel-Del station once stood at Riegelsville, where a tidy Roebling suspension bridge leads over the Delaware to Riegelsville, PA, named after a relative of the prominent paper-manufacturing family. The Riegel mill stood a few hundred feet downriver, where the Musconetcong River enters. The former general store that served Riegel employees stands straight ahead at the fifth grade crossing, just past the bridge. Warren Glen Road begins at the grade crossing. About 800 feet after crossing the tracks, turn right onto River Road (CR 627) at the first intersection. Then, after crossing the Musconetcong River, turn right onto the Old River Road. Anyone enthralled by vintage architecture will love the beautiful old homes along this stretch, marked on modern maps as Mt. Joy. Older maps call this hamlet "Musconetcong", so named by the railroad. At the stop sign, turn south back onto River Road (CR 647). Soon, Gilbert Generating Station is visible along the riverbank with the Nockamixon Cliffs of Pennsylvania towering in the background. River Road then passes through another former hamlet, Holland Station, which had a post office and station down by the old Bel-Del tracks. Traces of Indian civilization and vanished villages mark the entire district, as camps were kept up and down the river. Two rare artifactsÑone a piece of shale on which was carved the image of a village; the other a bannerstone with drawings of wigwams, a snowshoe, and a trail -- were found near the lime kilns, preceding those structures by centuries. At various locations down the road, and on both sides of the river, sources as reputable as the Smithsonian Institution and New Jersey's State Archaeologist refer to a legendary inter-tribal conflict arising from a dispute between two boys claiming ownership of a large grasshopper. Shallow burial grounds, caches of bones, concentrations of triangular points designed for warfare, and later references in Colonial-era documents, indicate a deadly escalation from a family feud to the Grasshopper War. The Milford Bluffs rise two hundred feet above the river and host prickly pear cactus on their southern face. The Milford Bluffs, a two-mile stretch of red shale cliffs that rise two hundred feet above the river, again constrict the road, at times down to one lane. The bluffs' southern exposure creates near-tropical conditions that have encouraged the unexpected growth of native prickly pear cactus cascading down the cliffs, blooming yellow in July and displaying purple pear-shaped fruits in late fall. Where the bluffs diminish, the road enters the village of Milford, both scenic and appealing, a nice place to stop before crossing the river into Pennsylvania. Over the Milford Bridge, in Pennsylvania's Upper Black Eddy, turn north onto yet another River Road, aka Route 32. This side of the Delaware has seen four different, but parallel, modes of transportation: the highway, the Delaware Canal, a trolley railway a few miles north, and the river itself. In the earliest days of settlement, raftsmen guided hundreds of gigantic rafts, sometimes over a hundred feet long, on dangerous trips floating goods to markets mainly in Philadelphia. The river's back current (eddy) here made it a popular stop for the travelers en-route from above the Delaware Water Gap. Heavy, non-buoyant products such as coal, limestone, and cement could not be transported in boats down the rocky and sometimes shallow Delaware. For these goods, calm-water, easily navigable canals were the answer. The river road parallels the 60-mile-long, hand-dug, Delaware Canal, which, by 1832, provided a commerce route from Bristol, just north of Philadelphia, to Easton. For almost a hundred years, canal boats, usually steered by the head of a family or his wife, were pulled by mule teams that were sometimes driven by their children. The captain and crew cooked their meals and slept on the boats while in transit. For years, hikers, bikers, canoeists, fishermen and birdwatchers have enjoyed the canal and towpath, now a Pennsylvania state park. But recent river flooding has devastated sections of the canal, necessitating its rebuilding. Heavy machinery artfully reshapes the canal contours, originally created with picks and shovels. 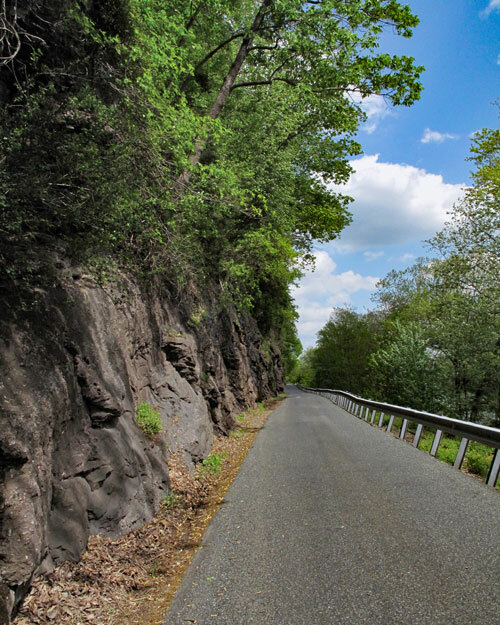 During construction of the Delaware Canal, when huge portions of the Nockamixon Cliffs were blasted away, there were complaints that their natural beauty had been ruined. But today, rare plants, numerous species of birds to observe, and breathtaking winter ice formations along the cliffs make the grievances seem irrelevant. About two miles after the river road crosses the canal above Upper Black Eddy, the wide bottomland suddenly disappears as the road enters "the narrows", between the canal and river on one side and a 300-foot-high precipice on the other. 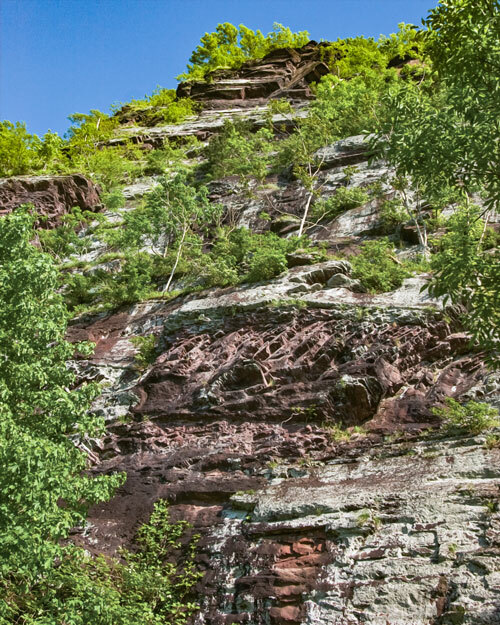 The Nockamixon Cliffs, stretching for nearly three miles, are entirely different from the toasty, cactus-clad bluffs across the river. The north-facing ledges host scarce alpine species, including one that is not otherwise found south of Maine. The old Indian Rock Inn is built nearly against the cliffs, and from the inn's deck an interesting illusion disorients, as the sun seems to set in the "east" over New Jersey. Because of an S-bend in the road and river, the sun does indeed set over New Jersey, but still sets in the west. The road soon passes the Delaware Canal's Narrowsville Lock No. 20 where there are picnic tables and a grill for use along the towpath. From a short distance north on the towpath it may be possible to view eagle activity near a nest on Lynn Island. Near the western end of the narrows, and at the edge of the village of Kintnersville, Route 32 ends at Route 611. Bear right and continue north past the stop sign. Route 611 parallels the short-lived Philadelphia & Easton electric trolley railway, which, by 1904, connected Doylestown and Easton. Intermittent rock cuts and beautifully laid up stone walls on the western side of the highway are all that remain of the old trolley rail bed. The P&E had a dozen passenger cars, powered freight cars, a hay car and snow plow. The equipment hauled passengers, mail, light freight and farm goods to market until 1926, when the trolley company folded, made obsolete by some of the first highway buses. 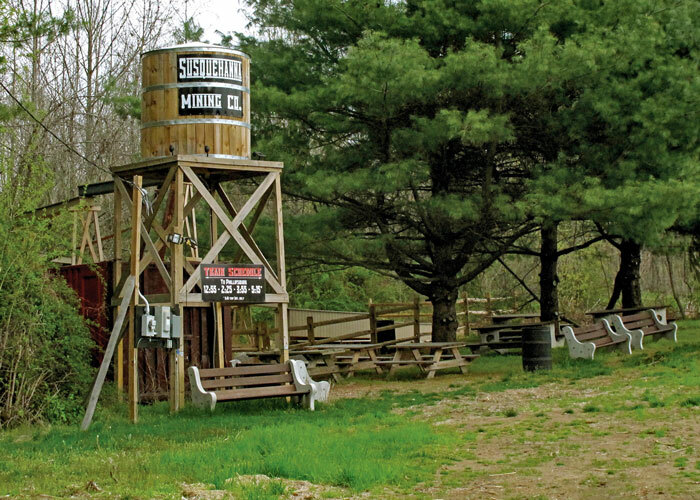 From Kintnersville north for nearly four miles, Route 611 cuts through Durham Township, famous for early iron production. The road passes alongside Rattlesnake Hill, where a mine opened in 1851, producing the largest quantities of Durham's best iron ore. On Mine Hill, just to the west, a mine was started as early as 1698 and supplied ore for Durham's earliest furnace, a purveyor of cannonballs and shot for the Continental Army during the Revolutionary War. Rattlesnake Hill is also notable for a large Delaware Indian jasper quarry near the top. And within the sector now protected by a conservancy, one of the iron mines has become Pennsylvania's second largest bat hibernaculum. The area also serves as a habitat for dozens of bird species, some of them rare breeders. Just past Rattlesnake Hill, near the Route 611 crossing at Cook's Creek, only scant traces remain of all that was once there. Taking advantage of the nearby canal's convenient supply of coal, furnaces were built in 1848, and, earlier, the famous Durham boats were designed and built at the mouth of the creek to carry iron goods down river. Durham boats also carried George Washington's army across the Delaware on Christmas Eve, 1776, for their crucial attack on the Hessians in Trenton. You can see a Durham boat replica near the old mill and post office in Durham village. Route 611 continues north through Rieglesville, PA. 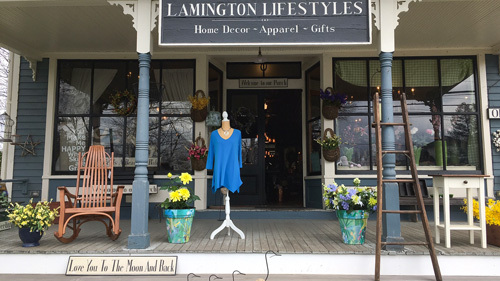 The nicely restored Mansion Row, homes of former paper company executives and other local industrialists, may indicate why this town flourished while neighboring hamlets disappeared. Turn right at the traffic light and continue over the canal to the Riegelsville Inn, located at the western end of the Roebling Bridge. The Inn was originally built in 1838 by Benjamin Riegel, known locally as "the farmer" in order to differentiate him from his nephew of the same name, who established the New Jersey paper mills. 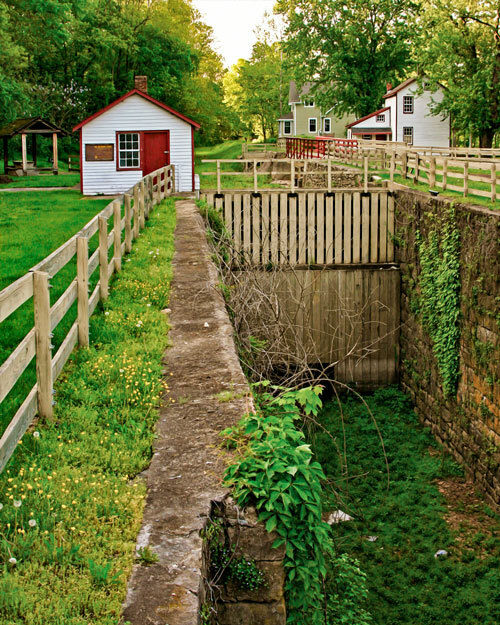 With 17 feet of drop, the Ground Hog Lock is Delaware Canal's deepest and northernmost lift lock. Further north, at the southern edge of Raubsville is the Delaware Canal's Ground Hog Lock, a double lock designated as Locks 22 and 23. With 17 feet of drop, it is the canal's deepest and northernmost lift lock. A parking area gives easy access to the canal towpath and as well as the Delaware River. When the P&E trolley company's steam-driven power plant failed to deliver adequate electricity, the small hydroelectric power plant that still sits next to Ground Hog Lock was built, using the flow of water diverted from the canal to turn its turbines. Uhlersville, another lost hamlet, surrounded Ground Hog Lock, but few traces remain of Peter Uhler's 1830s distillery, malt house and lime kilns; nor of the later store, paper mill, gristmill, sawmill and hotel. Pass through Raubsville, another scenic, quaint town that has grown and flourished, then soon under the I-78 overpass toward Easton. After passing Nesquehoning Street in a little more than a mile, the river road skirts along Mount Ida on the left. The lost hamlet of Williamsport (c. 1832) was once located at the base of Mount Ida where the road first passes a lime kiln then approaches and passes under the railroad bridges. The Glanz & Kuebler brewery, canal lock house and toll collectors office, a cooper's shop, two small taverns and tightly packed clapboard homes of immigrant workers were once tucked against the rocky cliffs, before they yielded to damage from recurring floods and demolition for the widening of Route 611. The site of Williamsport is fronted by the junction of the Lehigh and Delaware rivers, known as the "Forks of the Delaware". Three canals -- the Lehigh, the Delaware, and the Morris Canals -- also joined here. By raising the level of the Lehigh River, a canal company dam created a calm area so that canal boats coming down the Lehigh Canal could safely maneuver into either the entrance lock of the Delaware Canal or be lowered via another lock into the Delaware River to be pulled across into the Morris Canal entrance portal in Phillipsburg, NJ. The site is also in the process of reconstruction due to recent flood damage. A fish ladder allows shad to swim upstream around the dam and into the Lehigh River, and visitors can watch the migrating fish through glass windows as they swim past at eye level. Pinched between the Lehigh River and Mount Ida's cliffs, Route 611 curves sharply around to a traffic light at the south end of Easton's Third Street Bridge over the Lehigh River. Near this spot stood Mike Malarkey's Hotel, where the P&E trolley tracks ended. Two railroad lines had stations nearby. In Malarkey's bar, trolley passengers mingled with canal boaters, railroaders, trolley workers, and the South Easton locals. Immediately over the bridge Route 611 north turns right. At the traffic light, turn right and cross the free bridge to Phillipsburg's Union Square.